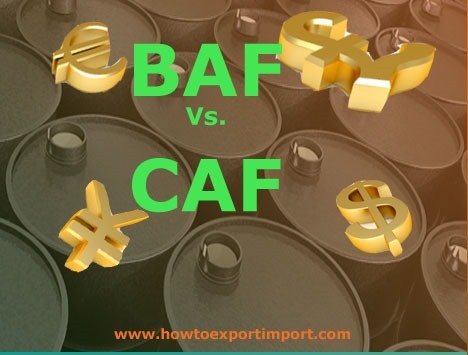 What is the difference between BAF and CAF? What is BAF? How does BAF work in international shipping? What does the term CAF means in shipping and international trade? 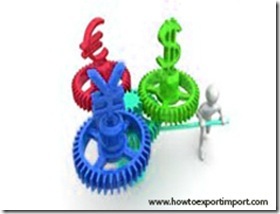 What are the difference between BAF and CAF in shipping under exports and imports? BAF means Bunker Adjustment Factor and CAF means Currency Adjustment Factor. How to distinguish between CAF and BAF? BAF and CAF are generally used by sea shipping carriers. These are charges which levied along with ocean freight to different locations at different season. When oil prices fluctuate globally, the BAF is imposed to basic ocean freight to stabilize the cost of freight. BAF has derived from the term bunker (fuel storage containers). Such surcharge is added up on the ocean freight by shipping companies to supplement fuel factor costs and termed as BAF. What is the term ‘CAF’? How does CAF work? CAF is one of the charges added up on the basic ocean freight by sea shipping carriers on the basis of continues fluctuation of exchange rates. Currency Adjustment Factor CAF is applied on freight rates to minimize or control the losses or gains against fluctuations on the currency exchange rate tariff. CAF is a part of ocean freight to balance and cater against difference in currency value fluctuations. 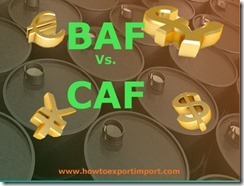 So, the major difference between BAF and CAF is that, BAF is related oil price and CAF is related to foreign currency. Also read Does exchange rate of currency effect export business? Is THC same in all ports? I hope, you have satisfied with this article about the difference between BAF and CAF. Have you satisfied with this article about difference between CAF and BAF? Would you like to add more information about BAF and CAF? Share your experience below about difference between BAF and CAF. Pandiyan D: On 07 July 2015 Dear All, I need detailed process for import purchase procedure which included payment terms , customs clearance everything for both SEA & AIR shipment with some case studies. Pls help. VISHAL KHRAT: On 26 September 2016 Dear Import Team Could you pls advise for import from China-via SEA, if the shipping terms is CIF from shipper then who will settle BAF charges, as destination forwarder/logistics mentioned that BAF charges billed from Origin... my consideration is as per terms, Terms CIF then shippers responsibly and risk till destination port, whatever charges between shippers door and destination port shippers freight part, hence this charges should settle by shipper only, kindly advise if i am wrong.. I am eagerly waiting for your kindly advise to improve my knowledge..
MR. VISHAL KHARAT: On 26 September 2016 Dear Import Team Could you pls advise for import from China-via SEA, if the shipping terms is CIF from shipper then who will settle BAF charges, as destination forwarder/logistics mentioned that BAF charges billed from Origin... my consideration is as per terms, Terms CIF then shippers responsibly and risk till destination port, whatever charges between shippers door and destination port shippers freight part, hence this charges should settle by shipper only, kindly advise if i am wrong.. I am eagerly waiting for your kindly advise to improve my knowledge..
Vishal Kharat : On 20 November 2016 Regarding for BAF charges, for import from China-via SEA, if the shipping terms is CIF from shipper then who will settle BAF charges, as destination forwarder/logistics mentioned that BAF charges billed from Origin... under the shipping terms CIF shippers responsibly to bare all cost till destination port, charges between shippers door and destination port are part of shippers freight, hence this charges should settle by shipper am i right?